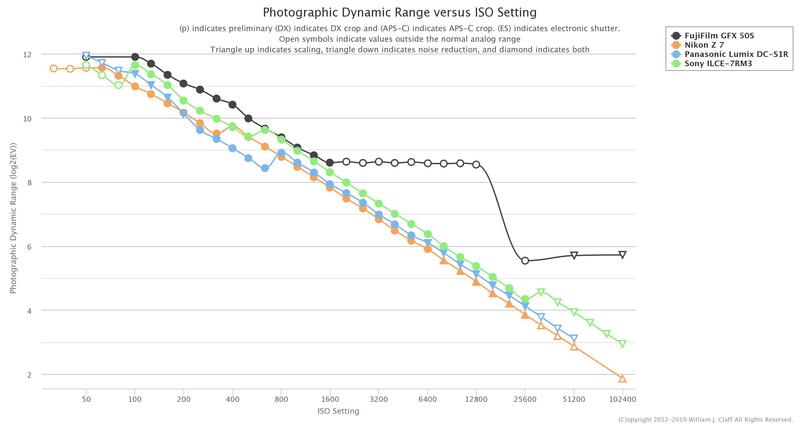 The Panasonic S1R has become the first Full Frame camera to surpass the max PDR of the Fujifilm GFX50S in Photons to Photos testing, which is surprising considering the Sony a7RIII and Nikon Z7 results. Especially since the S1R most likely uses the same sensor as the Z7 and D850. If you’re interested in manipulating the results above you can do so here. This entry was posted in Panasonic and tagged Fuji GFX, Fuji GFX 50R, Fuji GFX 50S, Fuji GFX50R, Fuji GFX50S, Fujifilm GFX 50R, Fujifilm GFX50R, Fujifilm GFX50S, GFX, GFX 50R, GFX 50S, GFX50R, GFX50S, LUMIX S1R, Medium Format, Nikon Z7, Panasonic LUMIX S1R, Panasonic S1R, Sony a7RIII, Super Full Frame. Bookmark the permalink. Trackbacks are closed, but you can post a comment.